Steven was smart enough to get out of the Northwest for a little while (to avoid the rain) and headed down to San Pedro’s skate park to shoot another Dakine ad. Click here for an interview and some videos. ‘TIMMY’S BIG ADVENTURE’ VIDEO PREMIERE SAT. NIGHT 12/18 @ 11:59PM @ PLAN B!! 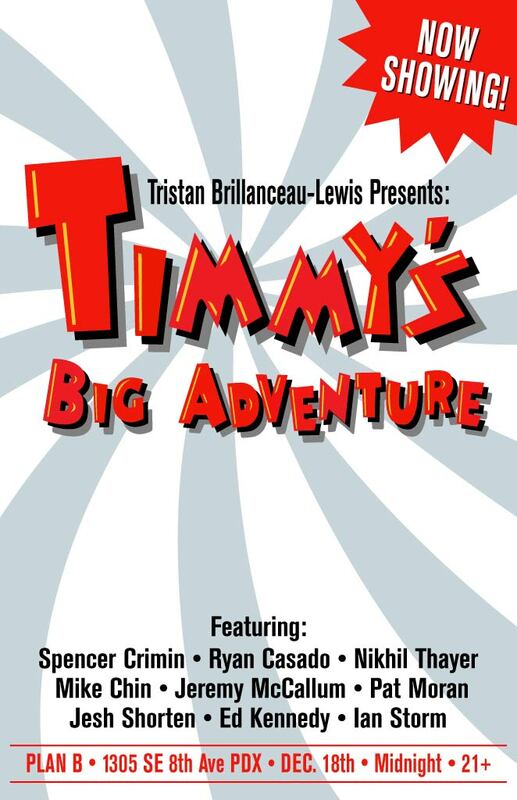 Widdow Timmy aka Tristan Brillanceau-Lewis will be premiering his new vid “Timmy’s Big Adventure” this upcoming Saturday night Dec. 18th @ Plan B. The shows 21+ which means Timmy will just barely make his own video. Congratulations T-Bone on another cinematic accomplishment. 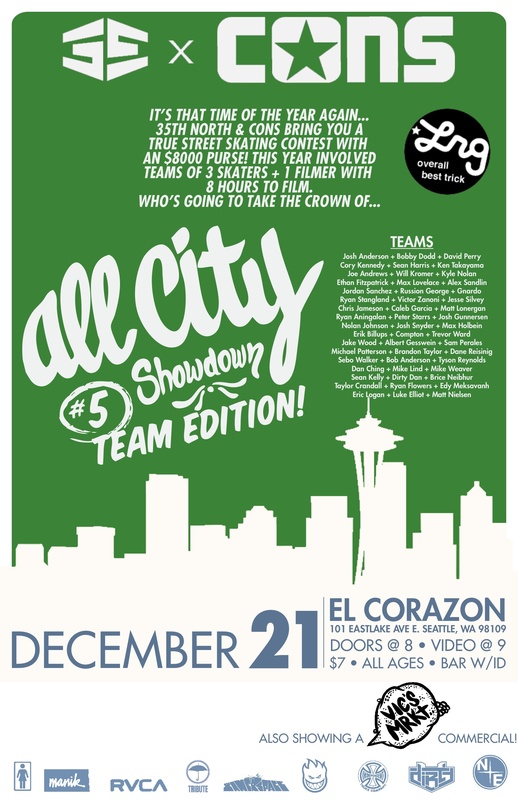 The All City Showdown video premiere is Dec. 21 @ 9pm in Seattle. Check the flier or click here for more information. C.WOODS video ‘TIME LAPSED’ premieres Friday night Oct. 29th @ The Academy Theater!! Cory Woods latest Full-Length Feature. Here’s all the info you need. Portland Spot Map by C. Woods. 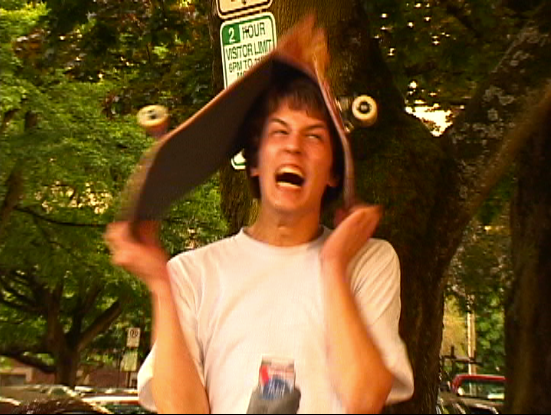 Obviously this is a huge bummer to many skaters in Portland’s skateboarding community. The Dept. always strove to be a positive contributor to that community and will continue to do so in whatever way it can in the future. The Dept. and Cal’s Pharmacy would like to extend their eternal gratitude to the previous building owners for the incredible support of skateboarding they provided by seeing it as the positive and constructive lifestyle and activity that it is-when for years that was not the popular opinion. The Dept. would also like to thank the many thousands of amazing skateboarders who shared some of their skateboarding experiences with us. The skaters themselves are what truly makes skateboarding the best. Stay tuned and we’ll see you out skating. DEATHWISH DEMO MON. AUGUST 2ND!! 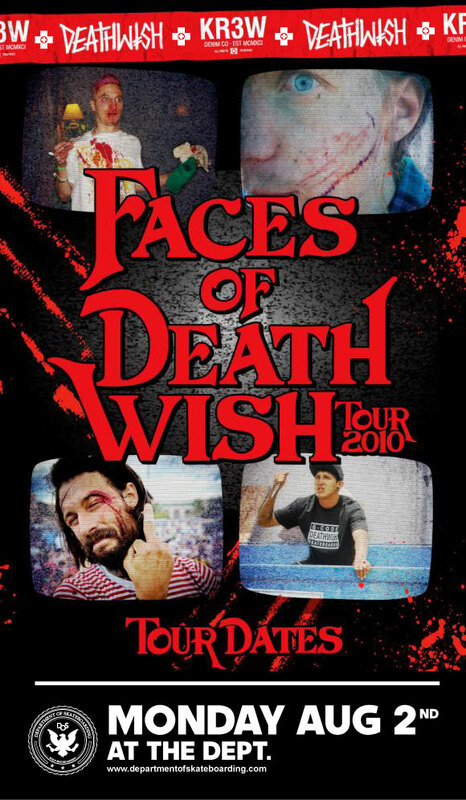 The Deathwish guys will be stopping by The Dept. Monday Aug. 2nd @ 3PM for a signing and demo. The whole crew is slated to be in attendance.. this is something that needs to be witnessed in person. Make sure to roll through and say what’s up to the Deathwish crew on their NW tour!! 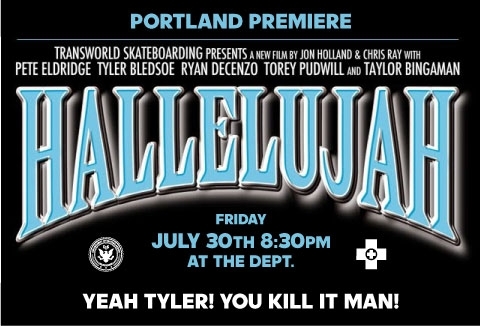 New Transworld video “Hallelujah” premiere this Friday night July 30th @ The Dept!! The premiere for the new TWS video “Hallelujah” featuring Tyler Bledsoe is going down this Friday night July 30th at 8:30PM @ The Dept. Tyler recently turned pro and has been working on this video part for the last year. The roster for Hallelujah is stacked- Bledsoe, Torey Pudwill, Pete Eldridge, Taylor Bingaman and Ryan Decenzo as well as a couple clips of some Portland homies. Hallelujah is definitely one of the most anticipated vids this year..make sure to cruise by and give Bledsoe some love. There will be NO 101 LESSON SESSION or regularly scheduled skate sessions due to the Wild in the Parks contest. Feel free to come by and enter/check out the contest though. 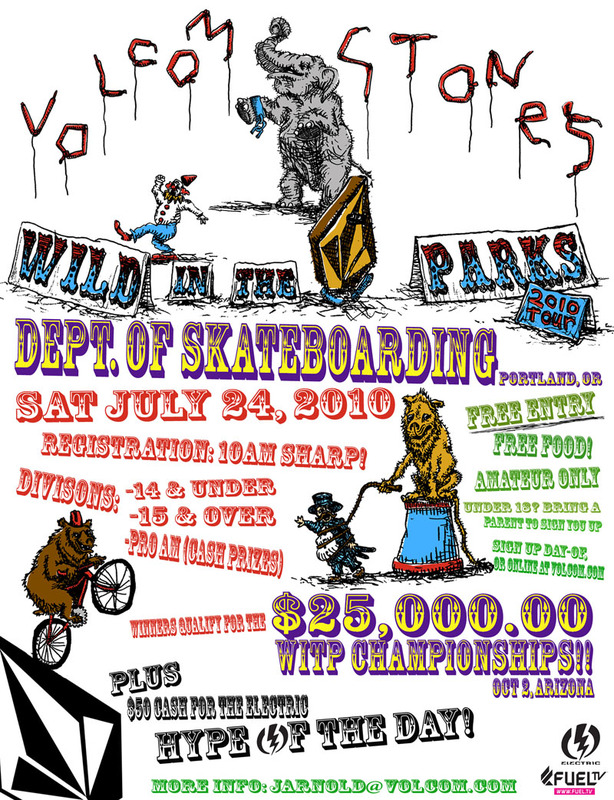 VOLCOM WILD IN THE PARKS CONTEST SAT. JULY 24TH @ THE DEPT!! The Volcom WILD IN THE PARKS contest will be stopping by The Dept. Saturday July 24th. 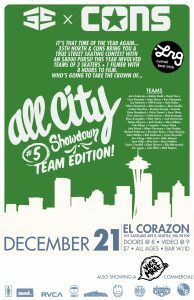 This will be the 4th year Volcom has come through and it’s always one of the most popular contests. There will be 3 divisions- 14 yrs and under, 15 yrs and over and Sponsored. Entry is FREE and winners will qualify for the WITP Championships in Arizona Oct. 2nd. Registration starts at 10AM- sign up the day of the contest or online HERE. See you on Saturday the 24th!! GATORADE FREEFLOW TOUR CONTEST THIS SATURDAY JULY 10th @ THE DEPT!! The Gatorade FreeFlow Tour is stopping through The Dept. this Saturday July 10th. The FreeFlow Tour is a nationwide amateur contest series with 20+ stops at parks across the country. The contest is open to skaters 21 and under and the winner of the Open division wins a trip to the Gatorade FreeFlow Finals in Salt Lake City at the Dew Tour stop Sept. 16-19th. The contest will be divided into 2 divisions: Junior Jam Division and Open Division. The Junior Jam is open to skaters 13 and under and has prizes for 1st through 3rd places. The Open Division is open to skaters 14-21 and will have prizes for 1st through 3rd places as well, with the winner heading to the FreeFlow Finals. Entry fee is $15 and you can register the day of the contest or online HERE. If skaters are under 18, they will need a parent or guardian present to sign GFFT Entry form/Liability Release/Publicity Release forms or they can get the forms online and have them notarized. Get into The Dept. this week to get your line down and see you on Saturday!! Dept. 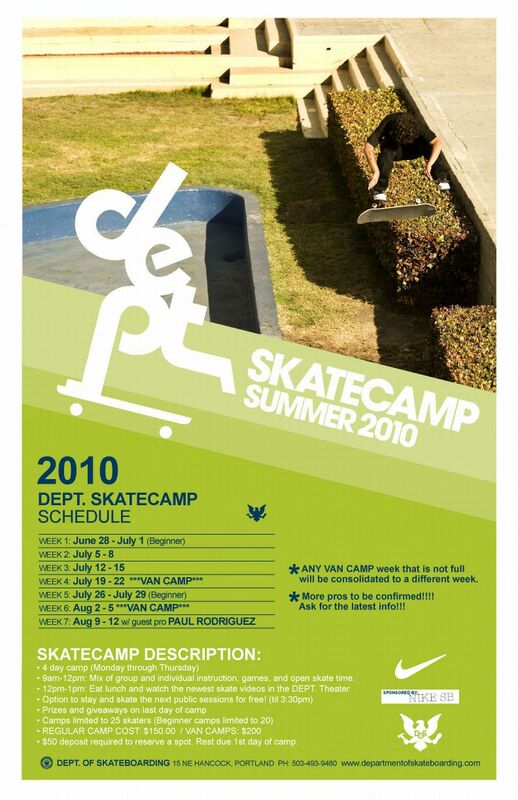 Summer 2010 Skatecamp Schedule is here!! Camps run Monday through Thursday from 9AM-Noon. There is a mixture of group and individual instruction, games, and open skate time. Campers are free to stay and skate through the public sessions until 3:30. There are prizes and giveaways on the last day of camp and each week is open to 25 skaters. Cost is $150/week. -Week 4 July 19-22: Mon-Woodburn/Aumsville, Tues-Battleground,WA, Wed-Beaverton/Hillsboro, Thu-Hood River. -Week 6 August 2-5: Mon-Corvallis, Tues-Canby, Wed-Tigard/Newberg, Thu-Springfield. Week 7 features a visit from one of the greatest pros in the world Paul Rodriguez. We generally have additional pro visits throughout the summer and we’ll do our best to update who might come through during other weeks. DEPT. “SPRING BROKE” SKATE CAMP MARCH 22-25TH!! The Dept. “Spring Broke” Skate camp will be going down March 22-25th. Camp runs Monday through Thursday from 9AM to Noon. Campers will be able to stay and skate all day through 6:30PM. Dept. Skatecamps are open to skaters of all ages and ability levels and provide instruction in basic skateboarding fundamentals as well as more advanced skating. “Spring Broke” Camp is open to 40 skaters and the cost is $125/week. Register by calling The Dept. at 503.493.9480 after 1PM or emailing at info@departmentofskateboarding.com. 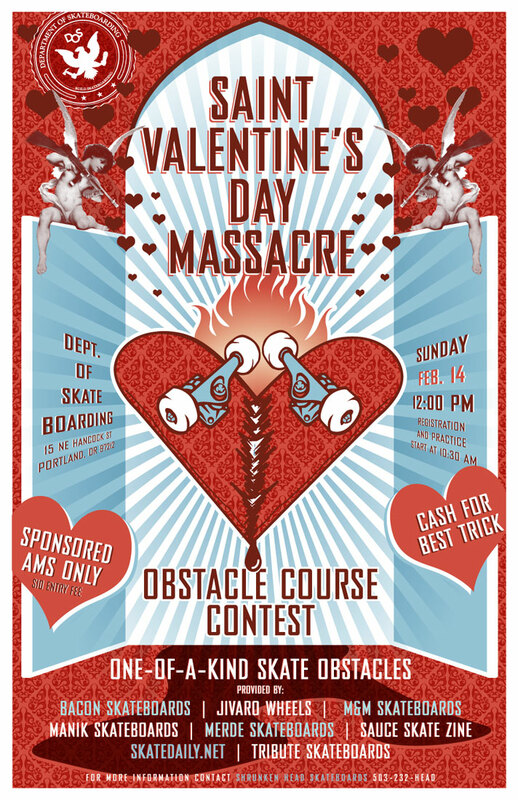 SAINT VALENTINE’S DAY MASSACRE CONTEST SUN. FEB. 14TH @ THE DEPT.!! The Dept. will be hosting the ST. VALENTINE’S DAY MASSACRE Contest Sunday Feb. 14th. Mike and Justin over at Shrunken Head are the masterminds behind this unique event that promises to be a departure from any contest you’ve experienced in the past. All your favorites in LOCAL PORTLAND SKATEBOARDING will be representing. Face it, you more than likely don’t have a valentine so there should be no good reason you don’t check this out. For more info hit up those guys at Shrunken Head!! 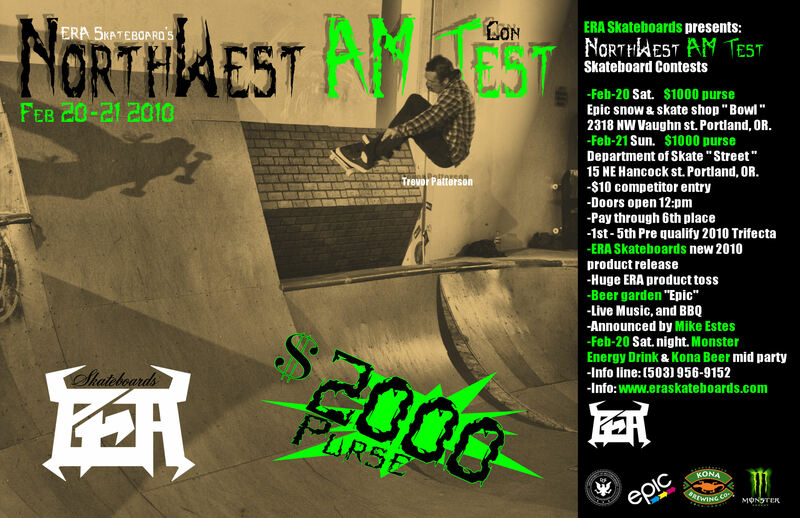 Era Skateboards will be putting on the NW AM Test Contest Feb. 21st @ The Dept. We’ll keep you updated on info as the contest gets closer or you can check it here. THE DEPT. WILL BE CLOSING @ 4PM TODAY FOR NEW YEAR’S EVE..
Last chance to shred for the first decade of the 3rd millenium. The Dept. will be closed New Year’s Day and be back on regular schedule Sat. Jan 2nd. HOLIDAY HAVOC 2 AM CONTEST WED. DEC. 30TH @ THE DEPT!! HOLIDAY HAVOC 2 2009 AM CONTEST Presented by Nike SB and Scion. 10:00AM- Doors open for registration and practice. Every entrant receives a HH2 tee and prize pack. 2nd through 5th places receive product prize packs and advance to the HH2 Invitational Round. 1st place winner receives product prize pack as well as the “Golden Ticket” to the Finals of the HH2 Invitational Round. $10 Entry Fee – Every entrant receives an HH2 tee and prize pack. The HH2 INVITATIONAL ROUND showcases some of the NW’s most talented skaters. HOLIDAY HAVOC 2 STREET FINALS: Presented by L.R.G. Individual run format – Two 90 second runs each, best run counts. Anything goes on the Street Course. Open to contestants who entered any of today’s events. All registration will go down the day of the contest. If you’ve never been to The Dept. before and are under 18 you need to have a parent/guardian present to sign a waiver or have a notarized waiver. See you on Dec. 30th! !